The Institute for Security Studies (ISS) kept the world informed as citizens of the Democratic Republic of Congo (DRC) voted in a high-stakes December 2018 poll characterised by delays, violence and a president clinging to power. Diplomats, media and NGOs depended on independent and authoritative insights from ISS senior research fellow Stephanie Wolters. Nearly 20 briefings were provided to the United Nations, African Union, diplomats and aid organisations. In just five weeks Wolters gave 68 interviews to global news organisations, including the BBC, Bloomberg, Reuters, AFP, RFI, the Guardian, Financial Times, Voice of America and Channel Africa. She wrote an editorial for Canada’s Globe and Mail and addressed a Chatham House seminar in London. Wolters has built an extensive network of sources during 20 years researching and analysing the DRC, including journalists, government officials, opposition politicians and diplomats. She lived in DRC for many years, is a regular visitor, and has travelled throughout the vast country. Information is also gathered from the Congolese diaspora. ‘The ISS is trusted by key contacts,’ Wolters says. ‘This is how we compile expert insights which guide informed decisions about a contested election in a complex environment.’ The ISS enables interested parties to appreciate different perspectives and understand the rapidly-shifting DRC environment. 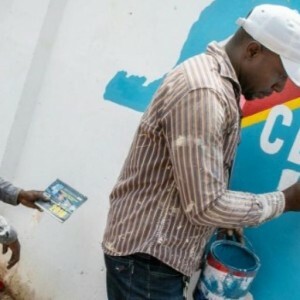 Preparations for the DRC poll took place in an atmosphere of distrust for the Independent National Electoral Commission (CENI). Questions were raised about voting technology and exclusion of opposition heavyweights Jean-Pierre Bemba and Moise Katumbi. Widespread protests led to civilian deaths and the international community condemned police and army human rights violations. The US and EU imposed sanctions on government and military officials. The DRC elections were finally held on 30 December after a two-year delay. The vote was relatively peaceful, but concerns quickly emerged about the count. Official results gave Felix Tshisekedi the presidency, despite Catholic Church monitoring which pointed to victory by opposition coalition leader Martin Fayulu. In May, the ISS will publish a Central Africa Report on the response of the AU and the Southern African Development Community (SADC) to the DRC crisis, followed by a series of reports on the geopolitics of the Great Lakes region and the role of African countries in the DRC.